What does it mean to be critically literate? What is the relationship between critical literacy and social justice? How do our personal values, beliefs, and perspectives influence our understanding of texts? How do texts communicate social relationships? What does it mean to consider a different perspective? What strategies can readers use to critically analyze texts in a critical manner? > Social implications are addressed, e.g., race, gender. McLaughlin, M., & DeVoogd. (2004). Critical literacy: enhancing students’ comprehension of text. New York: Scholastic. Comber, B. (2001). Critical literacy: Power and pleasure with language in the early years. Australian Journal of Language and Literacy, 24(3), pp.168–181. Wilhelm, J.D. (2007). Engaging readers & writers with inquiry: Promoting deep understandings in language arts and the content areas with guiding questions. New York: Scholastic. Students might assume that a story is just a story and does not communicate information about values and beliefs. Students may forget to “read” the pictures along with the text and may need scaffolding to use viewing strategies to deconstruct the images. Students may need concept of textual evidence reinforced and modeled several times. Students may need additional practice identifying perspectives present, take time each day to model identifying perspectives for students. It is possible to extend this into other areas such as social-emotional learning and conflict resolution by having students identify and explain the perspective of others involved in real life situations. 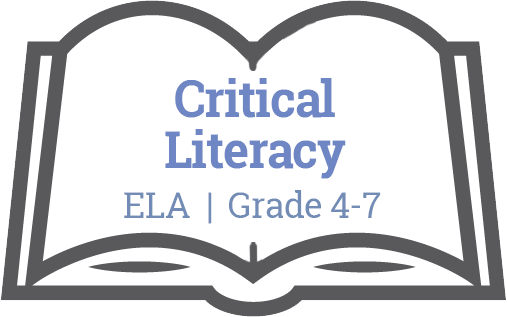 This unit is an introduction to the concept of Critical Literacy. It builds on students reading skills of comprehending and connecting. This unit would be an excellent precursor to critical literacy during the beginning portion of the year to allow for deeper comprehension and meaning making later on in curricular content areas. Critical Literacy is a useful and appropraite approach for the social justice areas of the curriculum such as governance, resource use, land use, and interconnectedness, First Peoples knowledge, and personal choices. Critical Literacy is an instructional approach that refers to the ability to read texts in an active, reflective manner in order to better understand power, inequality, and injustice in human relationships. This unit focuses on identifying the social implications of picture book fictional texts in order to build student comfort level and skill with Critical Literacy before students transfer those skills to content area , non-fiction texts. This unit can be adapted for any grade or ability level by changing the level of the texts used, and assigned, by the teacher.